As a region with a history of unparalleled variety and drama, from the Romans to the Moors, to the Golden Age of discovery, you’d expect Andalucia to offer its visitors hotels which encapsulate and personify this cultural richness. And you wouldn’t be disappointed. From castles to palaces, Roman to Moorish to modern Mudejar, the region offers some of Spain’s most alluring and spectacular places to stay, on beaches and mountain tops, in the heart of cities and in secluded countryside. Finca Cortesin, the Alfonso XIII, Marbella Club, La Bobadilla, the Parador de Granada – all legendary five-star hotels with something no other place can offer, be it a golf course which hosts international championships, original ceramic tiles and furnishings fit for a king, a palace built for a Nasrid ruler, an astonishingly authentic Andalucian village, or the chicest beach club on the Costa del Sol. Everyone who is anyone comes to stay here in Andalucia’s landmark hotels, from Pierce Brosnan, Brad Pitt and Shakira, to Eva Longoria and the US’s First Lady, Michelle Obama. So when you come to Andalucia, whether to get married or have a party; for your honeymoon; on a short break for a birthday, or another special celebration; or just as part of a European tour of a lifetime, these are the places which will provide you with memories to keep for ever. 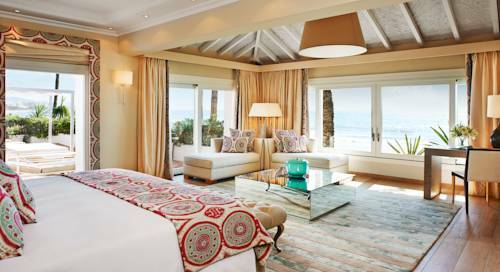 This sleek, beachfront modern hotel with Andalucian features has a spa, and is located near three golf courses. The hotel is 1 minute walk from the beach. Offering a seasonal outdoor pool and sun terrace and is set in Málaga in the Andalucía Region. Luxurious historic hotel in a 16th-century palacewith contemporary styling, spa and rooftop pool.